Every tree, branch and board that has ever grown is as unique as every person ever born. Each species of tree provides a distinctive style of grain, colors and change. 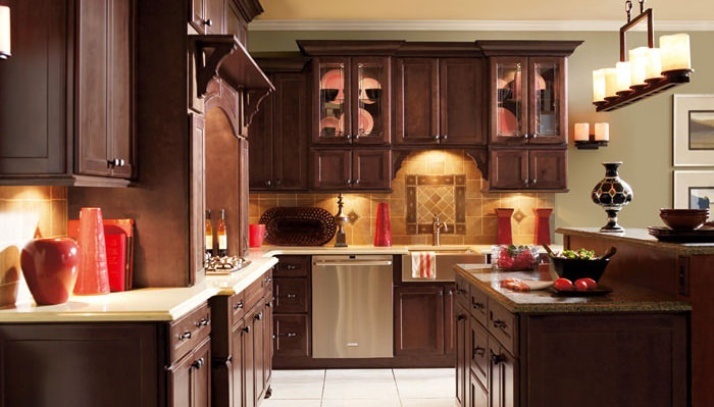 This list is a short set of descriptive words that you can use to understand wood while you're searching for the perfect kitchen or bathroom cabinets. Grain – Grain in wood is the direction of the fibers that were created as the tree grew. The grain can be straight, spiral, interlocking, curly and wavy. Because of the way that the fibers of the wood play with light, the grain can bend light, changing the appearance and texture of the wood. The cut of the wood, with, against or across the grain, can radically change the way the wood accepts stain and how it reflects light. Woods with distinctive and brilliant grains should not be painted or darkly stained so as not to hide the natural beauty of the wood. Color – Of course, color is added to wood with stain, paints and rubs, but wood also has its own natural colors. Ranging from chocolate brown to pale white, bright red to light green, the trees of the world grow woods that are all distinctive. Some woods, such as red oak, will actually change color shortly after being cut open and exposed to air. Mineral streaks – Wood will change color as the tree absorbs different nutrients from the soil. The density and colors of the mineral streaks will vary depending on the species and location it is grown. Lighter woods will show the mineral contaminants even more brilliantly than a naturally darker wood will. Movement and change – All woods can be affected by temperature and humidity, but some more than others. Coconut Palm, maple and cherry will all change significantly based on the expose to temperature and humidity. It is the unique and distinctive play of factors ranging from the weather in which a tree grew, to the minerals in the soil and the direction that the wood is cut will affect how it looks when it is turned into a cabinet in your home.